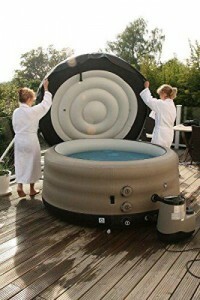 The Grand Rapids inflatable hot tub may be just what UK consumers are looking for! 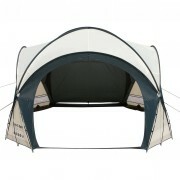 Unlike other products that we have reviewed, this model can be used all year round. Considering the fact that the British summer normally passes by without us noticing, the Grand Rapids tub will be there ready for you to use when the temperature outside inevitably drops. Suitable for up to 4 people, and very economical in both size and expenditure, this may just be our new favourite tub on the market. 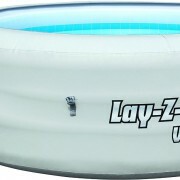 If you are looking for a pool substitute then this tub may not be for you. It can comfortably fit 3 adults (with a 4th squeezed in), so in no way is it ideal for large families. What it lacks in width, however, it makes up for in depth, being the most immersive hot inflatable on the market. With the Grand Rapids tub you can be submerged up to the chin, perfect for those wanting some massage therapy on the shoulders and neck. 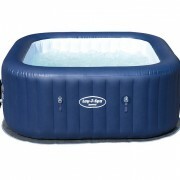 This tub was not designed with children in mind, as the water can be a little too deep for them to enjoy, but the manufacturers have solved this issue by making inflatable seats available to their customers for a very reasonable price. Consequently, there is no reason to fear that this tub might not be suitable for the whole family if you are prepared to pay for some added comfort. Like other variants on the market the Grand Rapids heats to a comfortable 40 degrees but what really sets it apart from its competitors is how quickly it can reach this temperature. The manufacturers of the Grand Rapids have been overly generous with their heating pump, which was originally designed for a much larger tub. Consequently the water gets hot in half the time of other models, just 12 hours from 0 to 40 degrees. This makes the Grand Rapids tub the perfect purchase for those on-the-go individuals that don’t have their schedules mapped out days in advance. Another feature of the Grand Rapids that simply cannot be ignored is the fact that it can be used all year round. Unlike its competitors, you will not need to pack it away in Autumn eagerly awaiting the illusive sunshine of the British summer. You can use the Grand Rapids to heat up and relax when you really need it, and you don’t have to worry about your top half getting cold either. 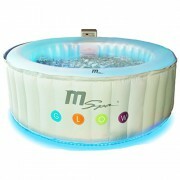 All purchases come with an inflatable lid and an insulating blanket that really keep the heat in. Both of those features make the Grand Rapids spa very cost-effective in comparison with its competitors. 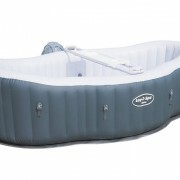 The Grand Rapids tub is very easy to set-up, taking less than 15 minutes to fully inflate. First off you need to find a flat area in the garden or in your home that is large enough to accommodate the 1.8 meter width. Thankfully, due to a padded bottom, the tub can be set up on decking with ridges without it hampering your future spa experience. Once you have decided upon your spot, just plug in your Grand Rapids to a standard UK socket until fully inflated, then fill with water. For those who are not technically or mechanically minded, you needn’t worry as there are very clear instructions to follow included in the box. The control unit allows you to set your optimum relaxing temperature, and once you are fully submerged it is child’s play to switch on the relaxing 88 massage jets. The Grand Rapids spa may not be the safest tub for those with small children, due to the very deep water. However, as with most other tubs available there is a handy inflatable lid which clips into place, giving you some peace of mind. Obviously, this safety measure should not be used instead of adult supervision. The inflatable lid also stops debris getting in to the water so it can stay fresh for your next dip. The Grand Rapids uses Contour Beam Technology, meaning 4 separate horizontal beams make this product more rigid than other tubs on the market. One downside is that the horizontal beams are quite wide once inflated, making them less economical with space than tubs that use I-Beam technology. The cushioned bottom gives you extra comfort, while the thermal blanket and inflatable lid keep the heat in and your bills low. The Grand Rapids comes with a heavy duty vinyl and artificial leather outer shell which makes punctures unlikely, and also makes it an attractive addition to your garden and home. As previously mentioned this tub heats up in double quick time and helpfully the heating system is combined with the filtration system for easy maintenance. 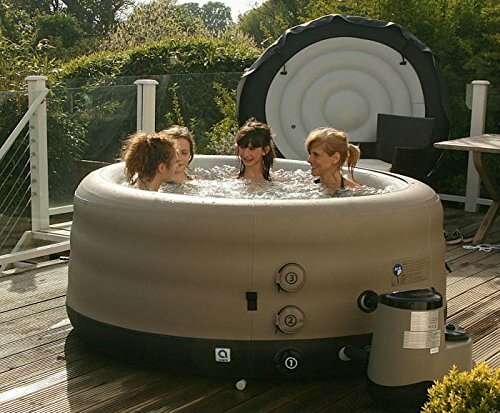 The Grand Rapids inflatable hot tub is the answer for lots of Brits looking for a backyard spa, due to its top notch heating system and its all-year-round usage. It may not be the biggest or the most child friendly but for those wanting to fully immerse themselves in a bubbling tub of deliciously hot water, it is unrivaled on the market.